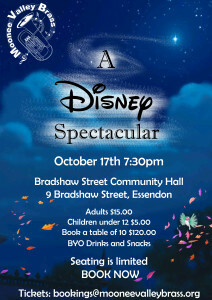 Moonee Valley Brass is proud to present……… A Disney Spectacular! 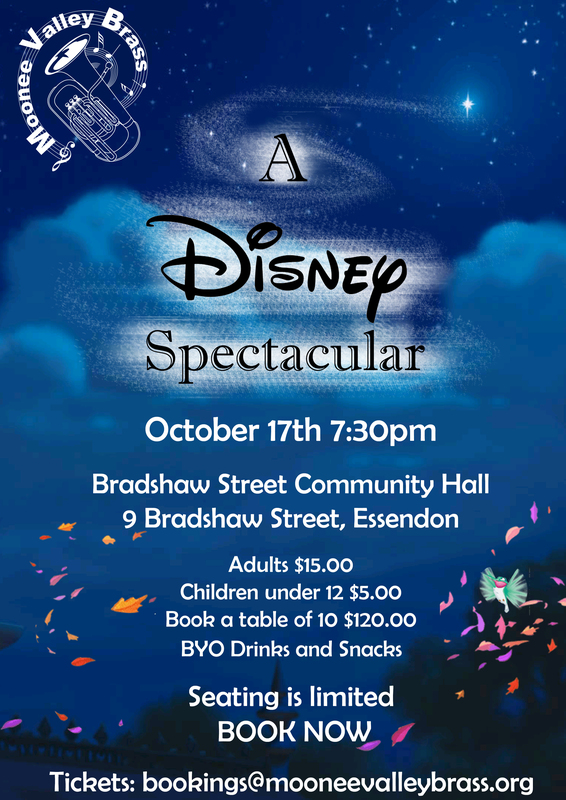 T his year at our annual cabaret night we explore the world of Disney – from Mary Poppins to The Lion King and everything in between! Featuring songs from The Incredibles, Frozen, Star Wars, 101 Dalmations, Pirates of the Caribbean and more, there is sure to be something for everyone! As in previous years we will be holding a number of games and activities throughout the night with plenty of exciting prizes to be won. Don’t forget your gold coins! BYO food and drink. Email bookings@mooneevalleybrass.org to reserve your seats today! Seating is limited so get in early to ensure you don’t miss out!